I was on the fence about doing an In My Kitchen post this month, I didn’t think I have time. BUT, this morning, I made time to share a few things. Thanks to Celia at Fig Jam and Lime Cordial for hosting! This is what is in my kitchen. . .
I’ve been studying herbalism the last few months. One project required making a strong lavender tea. When ever we have “spent” herbs left over from infusions, decoctions, tinctures or tea, it is recommended to compost the spent herbs. Well I adore lavender, every part of it. I couldn’t quite bring myself to bury the mass of spent lavender buds in the compost. Instead, I mixed them with a small bit of Modge-Podge and formed the flowers into a heart using a mold lined with plastic wrap. I let it dry overnight then brushed a bit more modge-podge over the surface and added a layer of dried lavender buds that weren’t spent to the outside surface. I added a bit of ribbon and a few drops of lavender essential oil and hung this lovely heart by my desk. I’ll probably place it in my lingerie drawer after a while. It is very comforting to be studying at my desk and have the lovely lavender aroma wafting by. I’ve been consuming a lot of tea this winter! 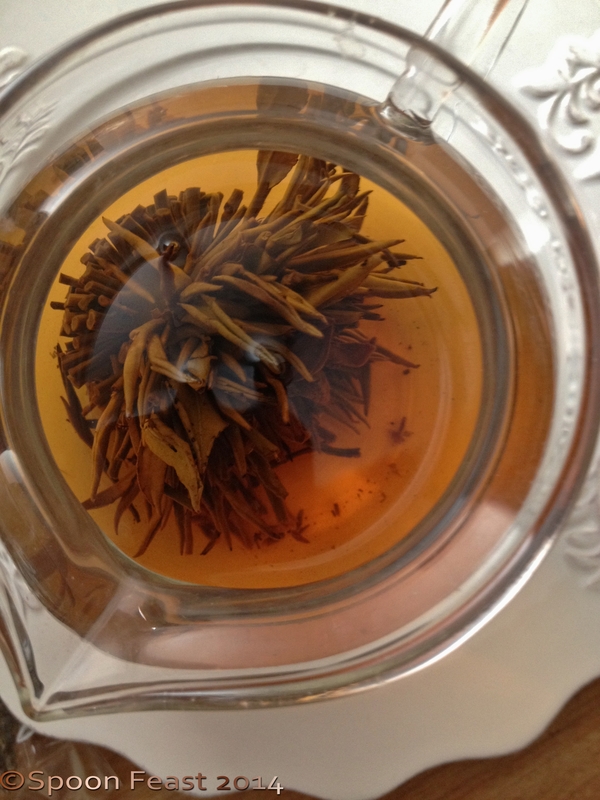 One of my favorites is Flowering Tea by Numi. Placing a hand tied tea bud into a glass pot, pouring boiling water over it provides a lovely unfolding of the tea bud. As the leaves unfold, sometimes there are tiny flowers tied inside that get released. it is quite a beautiful show for those who appreciate tea. Monday I start a course in Integrative Nutrition! I am so excited and motivated. 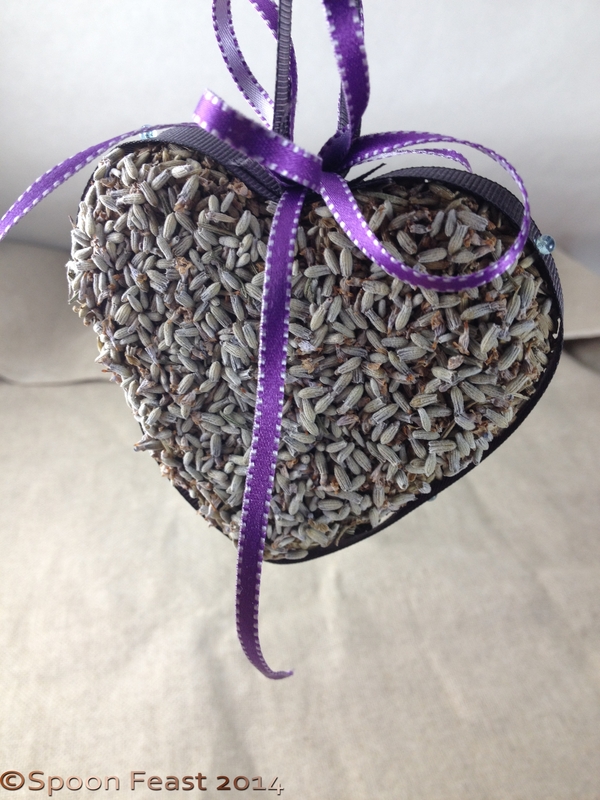 In my welcome box, they sent me this ever-so-cute velvet heart, filled with Lavender! I keep an artist model on my desk. Why? Not sure but I change the poses all the time. 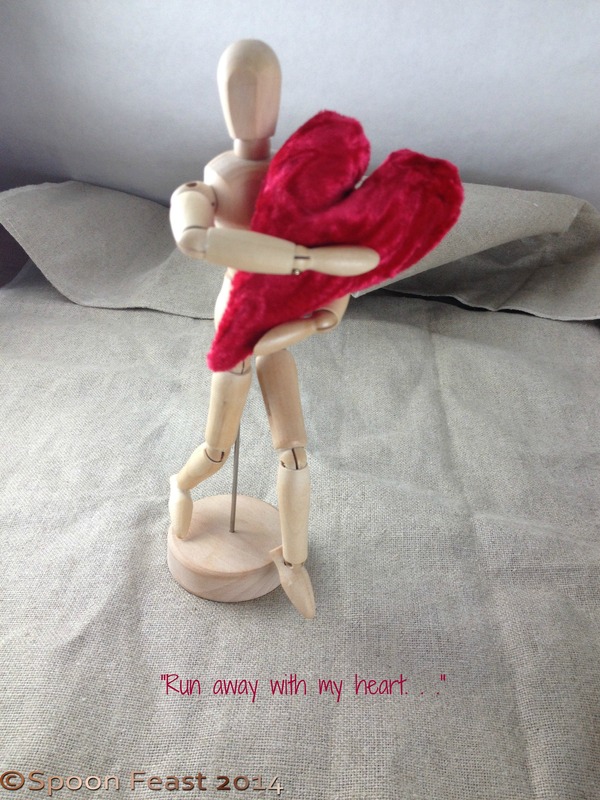 Right now it is finding lots of ways to hold on to the heart. One day I’ll start sketching the human body again. 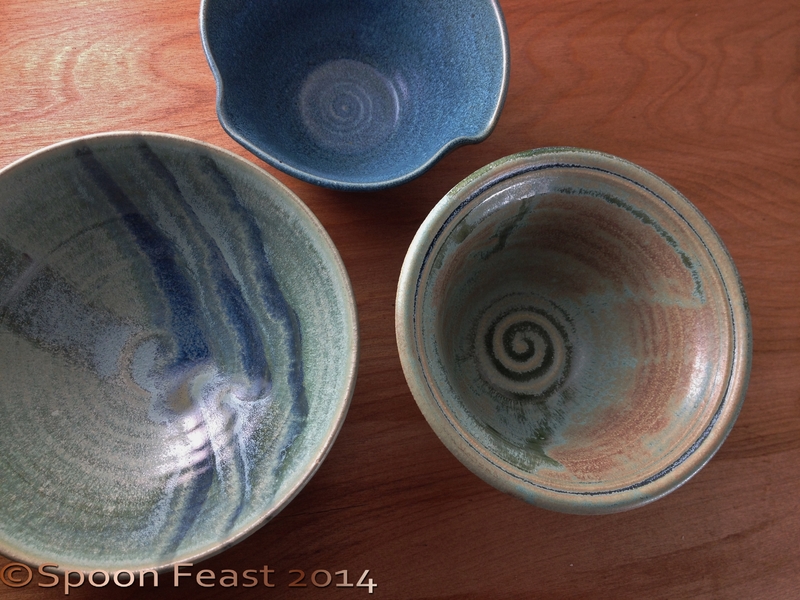 In My Kitchen are these lovely bowls collected from Soup On Sunday events over the years. I think they make great small bowls for all kinds of things. This bread mold was ordered thinking it was a pate or terrine mold. 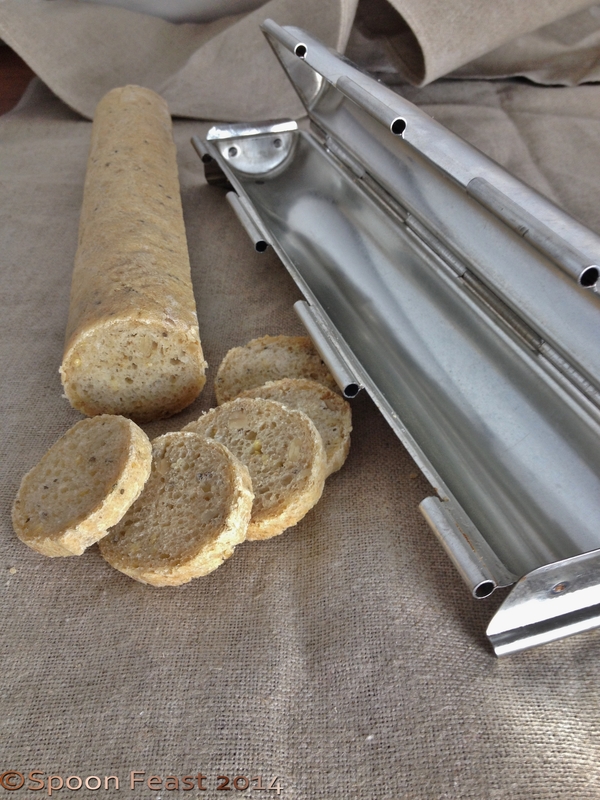 I’ll be working this later today to see just how bread turns out. 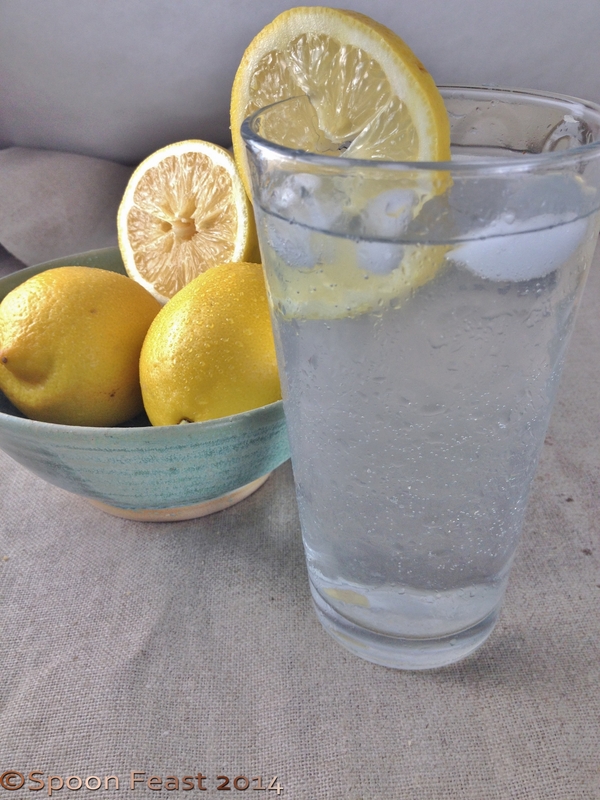 I’ve started to drink a glass of water with lemon (no sugar!) in it not only the first thing in the morning, but all day long. I’m working on getting up to 8-10 eight ounce glasses a day. The big thing with beverages is to watch the sugar content! I’d bet that most people don’t realize how much sugar they are consuming through beverages alone. How about you? This entry was posted in Recipes and tagged flowering tea, In my kitchen, Lavender, lemon water, nutrition class. Bookmark the permalink. Love this post! So funny, but I adore lavender, tea, and learning about nutrition! I would love to hear more about this new class you are taking? Hope you are well. 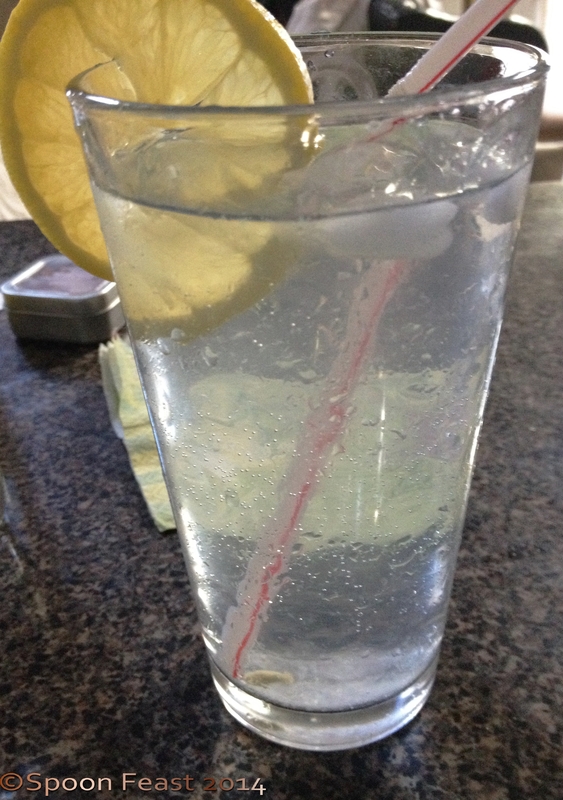 I drink lots of water every day and don’t drink soft drink. Still, the red frogs I eat have more than enough sugar in them! How curious that bread mold is. Do you bake in it or put bred in it and compress to make the shape? Thanks for the tour. You fill the mold half way, let it rise about 3/4 of the way, clamp it shut and bake it in the mold. That’s why the crust is light. 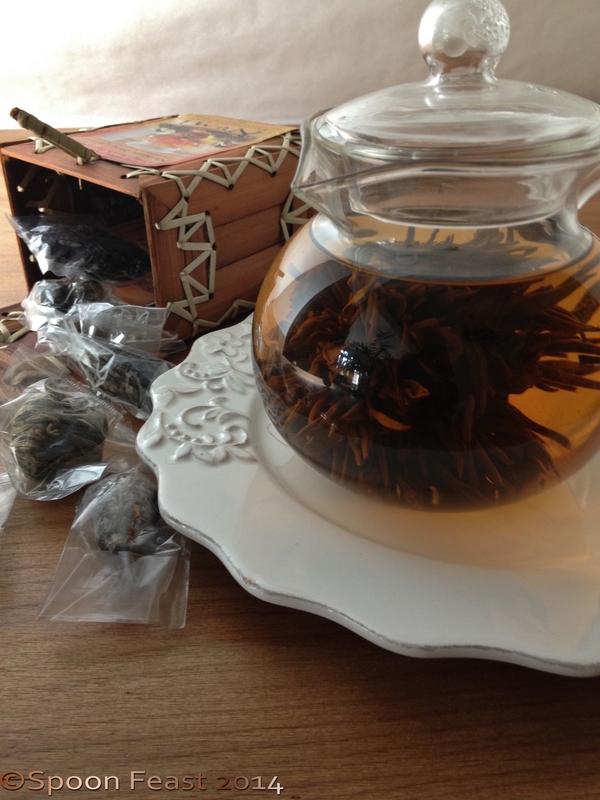 Your flower tea looks very decorative – does it taste as good as it looks? Ahh! Yes! It has the power to make you feel special as you watch it unfold and sip. True delight! Hi Pamela, I love that bread mould. I think I love all moulds. It must be my need to control things. You know, it scared me at first, not being able to “see” what was going on inside there but it turned out OK. I love the round shape! Hi Carolina, thanks for stopping by! The herbal class is taught online by Learning Herbs.com There’s a new class starting in March. Hope to see you in a class one day! G’day Pamela and what an interesting post today, true! Love your bowls and is so much to learn about herbs…herbs are very healing and help improve the quality of one’s life too! Cheers Joanne! Thanks, I feel I’m just scratching the herbal surface. there is so much to know and learn. I would love to see all those roots and herbs! I’d certainly go crazy. I’ll be checking it out! Thanks.